Design and Technology is about designing products that will improve our everyday lives. Creativity is a fundamental part of design and technology. Many designers believe the quality of the initial idea and thought-provoking, innovative design to be cornerstones of every successful product. The creative design and make activities within Key Stage 3 seek to develop creativity and confidence in student’s ability to think, question, explore, create and communicate. Combining knowledge and understanding with practical skills, these activities are intended to provide breadth in creative learning and depth in the application of practical and transferable skills. What is it like to study Design & Technology at GCSE? The controlled assessment consists of a major design and make project completed in graphic materials. - Graphic projects will be completed in a combination of boards, wood and plastics. - Product design projects will be completed in resistant materials such as wood, metal and plastic. - Textiles projects will be completed in predominately fabric-based materials. You will complete a core section of the course that is the same for all D&T GCSEs. You controlled assessment will be completed in your chosen material area. You will answer questions in the exam about your chosen material area and broadly across all material areas. Design and Technology is about designing products that will improve our everyday lives. Learning about Design and Technology will help you to develop design, make and thinking skills that open up a world of possibility, giving you the tools to create the future. It is a subject that brings learning to life, requiring you to apply your learning to real-life situations with a combination of design and practical make activities. This qualification will give you an opportunity to be creative and innovative, making use of other subjects such as mathematics, science, art and design, computing and humanities. Pupils learn to understand and apply the basic principles of nutrition and healthy life styles alongside the development of a range of food products. Through practical tasks, skills (cutting, shaping and finishing skills) are developed to promote independence and precision. Students produce a variety of dishes that include fruit salad, pasta salad, pizza, small cakes and a larger celebration cake. Through these activities students develop quality making skills understanding the pressures of producing products within an hour lesson and working to a deadline. They learn how to engineer given recipes to their needs, or the needs of their client group, making modifications to meet different dietary requirements and resulting in new and exciting, marketable food products. Students learn the fundamentals of communication and promotion of design proposals. Through a promotional project students design and manufacture giveaway items such as glider, bookmark and sun visor. Alongside hand drawing techniques students are introduced to computer aided manufacture and three dimensional drawing packages. Through the critical analysis of existing products, student learn to inform their design solutions with relevant sources. Students learn the importance of meeting client needs and the necessary research skills needed to be able to successfully follow a design brief and produce marketable ideas and products. Students solve creative, relevant design problems, manufacturing a range of products that use modern and traditional skills. Through design activities students understand the principles of good design, learning strategies to generate creative solutions. Through practical activity, students learn how to plan the manufacture of their product, taking into consideration factors such time, materials and processes. Students use traditional hand tools alongside modern equipment such as the laser cutting and 3d printing. They will also learn soldering and hot metal casting to develop their understanding of how to select manufacturing methods. Products include at trophy, jewelry and an electronic vibrating bug. Students design and manufacture an environmentally themed cushion that focuses on fabric embellishment. Through research tasks they develop understanding of environmental issues and sustainability considering how ethical and social dimensions interact to shape designing and making. Students are introduced to properties and structure of fabrics and learn how to use machinery and equipment, combining computer aided manufacture alongside traditional techniques to make quality products. During Year 8 students select a material area or areas in which to specialise in Year 9. Students develop a variety of research methods and analytical skills to produce product specifications that informs their design choices to make a variety of products over the course of the year. A variety of software packages are used to communicate design proposals. Design briefs include designing snack products for the school canteen and products that encourage a healthy life style and good nutrition principles. Throughout the year students develop a range of practical skills that provide students with a firm basis for GCSE Food. Practical dishes include healthy snack products such as soups, cakes, pasta, pastry, bread and healthy teenager meals including rice and pasta salad, small cakes and cookies. Students build on the communication skills achieved in Years 7 and 8 to develop their use of computer-aided packages such as Sketch Up and 2D design to communicate more complex ideas. Through a range of projects students learn about graphics materials, printing processes and sustainable design to provide a solid base for GCSE Graphic Products. Projects are based around the themes of marketing, packaging and architectural design. Students are encouraged to develop concept ideas that are innovative and original. Through research of existing products and designers, students identify a gap in the market that their design will address. Projects include a concept design for a new mobile digital device, the design for a new shop for the Castle shopping centre and repackaging a product from an existing brand. Students experience a variety of design briefs that involve making decisions about customer needs and manufacturing processes. 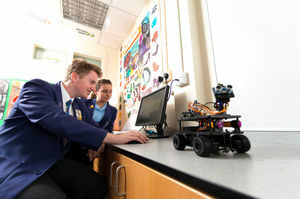 Projects encourage students to take ownership of their design and develop a range of practical products that make use of a range of process that include computer-aided manufacture and electronic circuits. Projects include the manufacture of a lighting module and a small amplifier speaker. Alongside this, students will take part in smaller standalone projects that develop their problem solving skills and ability to work as part of a design and manufacturing team. The projects in Year 9 provide a solid basis for GCSE Resistant Materials. Students work in ‘company’ teams to design and make a range of accessories based on their own theme choice. They develop decision-making skills through individual and collaborative working. Design will be original creative and address a specific design problem. They will learn new construction and decoration techniques as they produce a hat or bag. Additional projects are designed to introduce students to clothing construction. Students have the opportunity to customise their designs using computer-aided design and small electronic components. The projects in Year 9 provide a solid basis for GCSE Textiles.